OSLO, Norway — Norwegian distributor, LydRommet, has had a busy summer, designing and setting up an extensively upgraded light, audio and AV system at The Norwegian Academy of Music in Oslo. The Norwegian Academy of Music is one of Europe’s leading artistic and academic institutions. As well as a highly competent staff of 180 to cater for more than 600 students, the buildings and facilities provide among the best and most contemporary music education environments in Europe. The academy has custom designed rooms, excellent recording studios and concert halls, which facilitate over 300 concerts a year. According to project engineer Stig Gunnar Ringen, high-quality, user-driven solutions for teaching and concerts were central goals for this project. "The installation has made the concert halls much more flexible and suited for the broad diversity of musical expressions we accommodate, without coming at the expense of the unique acoustics of the halls,” he said. In Lindemannsalen, the main hall, eight JBL VERTEC® VT4886 subcompact line array loudspeakers and two VT4883 subwoofers are fitted on each side of the stage, as well as four VT4886 loudspeakers comprising a center cluster. A pair of JBL VTX F12 loudspeakers, along with four F18S subwoofers are used at the floor level, as well as monitors and multi-purpose loudspeakers from the JBL VP series. 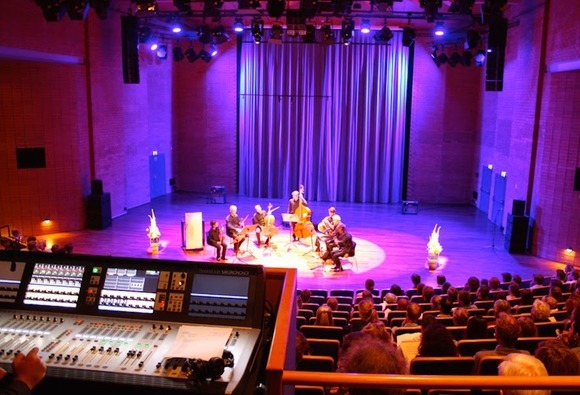 Both of the concert halls have been equipped with the new Soundcraft Vi3000 console, each connected to a Soundcraft Vi stagebox, located in a central machine room. The Vi3000 utilizes the new internal DSP SpiderCore based on the Studer Vista 1 engine, with Soundcraft’s Vi Version 4.8 operating software, adding a fourth 24-channel fader layer to improve access to the console’s 96 input channels. The surface operation and layout is similar to other Vi Series consoles, providing a familiar feel while offering expanded functionality. The Vi3000 features upgraded microphone preamps and 40-bit Floating Point DSP processing for superlative sound quality. The system is powered by nine Crown I-Tech amplifiers, and monitored and processed by JBL HiQnet Performance Manager™ software. LydRommet, founded in 1978, is one of Scandinavia’s leading distributors of professional audio products and systems. In the pro audio industry in Scandinavia LydRommet is known for their dedication to quality sound, high competence and level of service.